In this section, students explore their relationships with others. The activities focus on peer relationships and how peer pressure, influence, and acceptance affect their lives. There are also activities on refusal skills to help equip students with strategies for saying "no." Students need to be reminded that it sometimes takes skills to extricate themselves from uncomfortable or embarrassing situations. If, for instance, a girl is asked out on a date by a boy she has no interest in, but whose feelings she doesn’t want to hurt, she is going to want to use tact in her refusal. 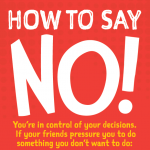 In this activity, students will practice saying “no” to their friends. Go over your students’ answers together. In discussion, keep in mind how important it is for students of this age to “save face” and “fit in” with their peers. Try to get the students to talk about how to manage a situation in which they want to both say “no” and remain a valued member of the group. To wrap up, talk about the difference between rejecting an idea or an action (“I don’t like the idea of smoking…”) and rejecting a person (“…but that doesn’t mean I don’t like you”). Use the supplemental “Geek at the Party” video to complement this section. Activity 3: Tobacco—Using It Is Unhealthy! Activity 5: What Would You Do? Activity 4: Peer Pressure and Influence—Do Your Friends Affect Your Decisions? Activity 5: What’s Important to Me! Activity 10: It’s Decision Time!